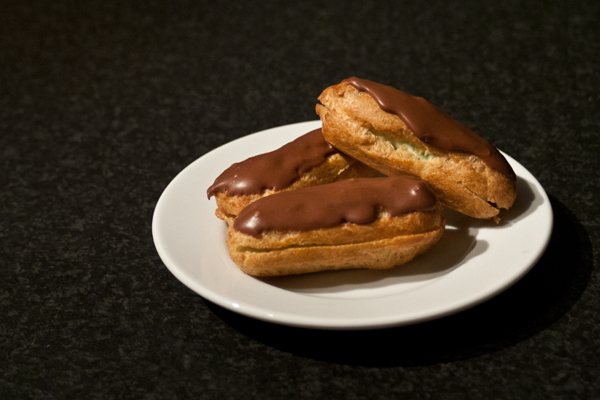 Towards the end of Bake Off, one of the challenges included baking with choux pastry, which instantly reminded me of the eclairs my mom used to make when I was little. There’s seriously something magical about watching these tiny tubes of dough literally explode into crisp, airy pastry. They instantly triple in size due to the rapid heating of the water within the dough. My mom’s recipe for the pistachio filling involves using Jell-o instant pudding, which I had to order from Amazon. For a few of my recipes there are some ingredients that are difficult to find in stores here in the UK, but Amazon is seriously a life saver in these situations, as many American ingredients and foods are sold there. On Bake Off, they made choux cakes, but I decided to stick to basics and make mom’s eclairs instead. 2. Bring the water to a boil in a medium pan. Once boiling, add in the butter and gently stir until it melts. Add in the flour and salt and stir vigorously until the mixture forms a doughy ball. Remove from the heat and allow to cool slightly. 3. Add the eggs to the dough mixture, one at a time, and stir until smooth in between each addition. Place the pastry dough into a large piping bag with a 3/4-inch tip. Pipe the dough into 4-inch long tubes onto greased baking sheets. 4. Bake the eclairs for 15 minutes at 450°F (230°C), then reduce the heat to 325°F (160°C) and continue to bake for another 25 minutes. 5. Once they are baked, remove from the oven and split the eclairs in half lengthwise (like a sandwich), turn the oven off and place the sliced pastries back in the oven to dry for about 20 minutes as the oven cools. Finally, place onto a wire rack to cool completely. 6. To make the pistachio filling, first whip the whipping cream until it is nice and frothy. Next, mix together the milk and instant pudding in a separate bowl, then gently fold in the whipped cream. Spoon or pipe the filling into the cooled eclair shells. 7. Finally, make the chocolate glaze by mixing melted chocolate, powdered sugar and enough milk to thin glaze. Coat the tops of the eclairs with the chocolate mixture.